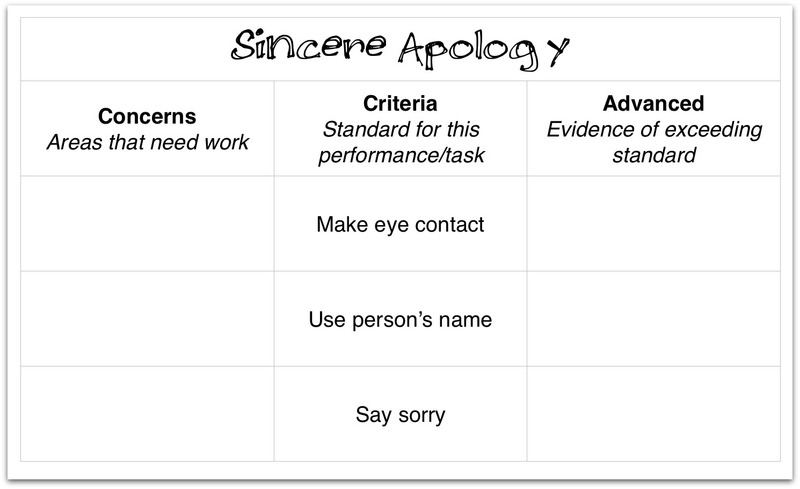 In the classroom: Single Point Rubric? Long story short: it's a single set of criteria with room to record notes/evidence for performance above and below standard. Am I showing my age when I say "and here's one I prepared earlier"? There are about as many formats as there are users. I chose this one because it's familiar. I struggled to get my head around the idea during the PD session for a couple of reasons. The first being that as a concept it's pretty simple, and glaringly familiar. I was confused by this. The example we were shown had about 30 criteria though (the entire Digital Technologies learning area) so I was puzzled: how was that remotely practical? Once the penny dropped that - in practice - these rubrics need only have the same criteria as any other rubric, aside from feeling a little foolish, I was intrigued by the potential. Next I wondered how these were significantly different from the success criteria that I already use. (I post our success criteria on the wall (as you can see here) or task sheets.) In a nutshell: they're not! Well, sort of. They are in a different format with an assessment focus but using the same ideas and words. Single point rubrics use these success criteria as the basis for identifying and recording evidence and feedback. Ultimately this is another tool to add to my repertoire. 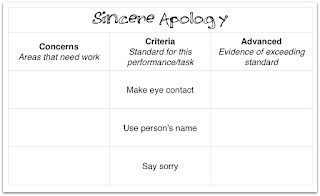 I can see how easily it could enhance my current practice: after building student capacity to identify success criteria - based on the curriculum achievement standards or whatever else we're working toward - these are publicly posted and used to create a single point rubric. Over time student capacity is built to use the rubric as a form of formative self assessment and peer assessment. In some ways it feels like a formalisation of what already happens. Do you use single point rubrics? Any tips for success?